Since the publishing of Debbie Qaqish’s book the Revenue Marketer the thought that marketing is not only responsible for demand-gen and product marketing, but also revenue has cause elation and fear in the marketing suite. 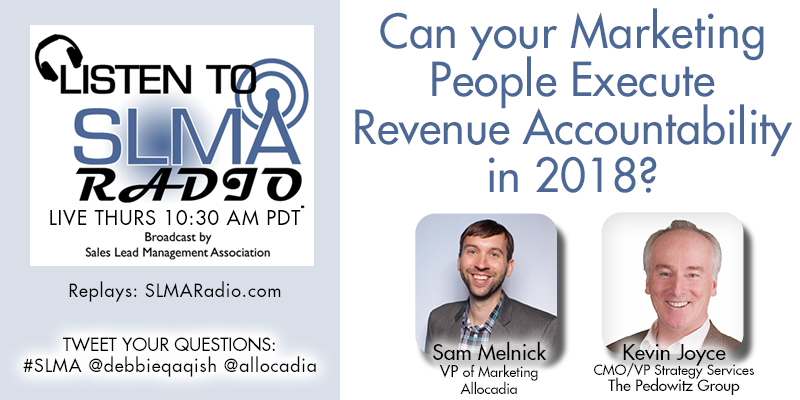 In this interview with Kevin Joyce of the Pedowitz Group and Sam Melnik VP of Marketing at Allocadia the two discuss major changes in planning and marketing operations that are taking some people and companies by surprise. Does every company require a Marketing Operations Manager to plan and execute this MPM process? Sam Melnick is the VP of Marketing at Allocadia, the leader in Marketing Performance Management software, managing over $20B in marketing spend to-date. He is an award-winning and analytically driven marketing professional with experience as a marketing practitioner at Vivox, CMO industry analyst at IDC, and customer success manager at a Lattice Engines. Sam is a frequent speaker at marketing industry events and prolific author of marketing research. He was recognized as a top 50 most influential marketing technology professional, plus one of New England’s top 40 influencers in content and digital marketing. Sam is a graduate of UMass Amherst’s Isenberg School of Management. Allocadia is the leader in Marketing Performance Management and creators of the #RunMarketing movement. The company's award-winning technology empowers marketers with confidence in their plans, investments, and ROI. Founded in 2006 by twin sisters Kristine Steuart and Katherine Berry, Allocadia today serves more than 10,000 marketers worldwide, managing over $20B in marketing investment to-date. Learn how leading marketing organizations at over 200 companies including Microsoft, Juniper Networks, VMware, Red Hat and Charles Schwab run the business of marketing at Allocadia.com. Kevin Joyce is CMO and vice president of strategy services with The Pedowitz Group. He holds a unique combination of marketing skills and sales experience that helps companies to bridge the gap between sales and marketing. Last year he was named one of SLMA’s Top 40 Most Inspiring in B2B Lead Generation. The Pedowitz Group wrote the book, and is the undisputed thought leader on Revenue Marketing™. As your partner, TPG helps you plan, build and optimize your revenue engine by delivering services in MarTech, demand generation and marketing operations. To discover how we can help your organization become successful Revenue Marketers™, visit http://www.pedowitzgroup.com, or call us at 855-REV-MKTG or visit Revenue Marketer Blog.